Setting up indoor localization systems is often excessively time-consuming and labor-intensive, because of the high amount of anchors to be carefully deployed or the burdensome collection of fingerprints. In this work, we present SALMA, a novel low-cost ultra-wideband-based indoor localization system that makes use of only one anchor with minimized calibration and training efforts. The system leverages the gained insights of our previous works, exploiting multipath reflections of radio signals to enhance positioning performance. To this end, only a crude floor plan is needed which enables SALMA to accurately determine the position of a mobile tag using a single anchor, hence minimizing the infrastructure costs, as well as the setup time. We implement SALMA on off-the-shelf UWB devices based on the Decawave DW1000 transceiver and show that, by making use of multiple directional antennas, SALMA can also resolve ambiguities due to overlapping multipath components. An experimental evaluation in an office environment with clear line-of-sight (LOS) has shown that 90% of the position estimates obtained using SALMA exhibit less than 20 cm error, with a median below 8 cm. 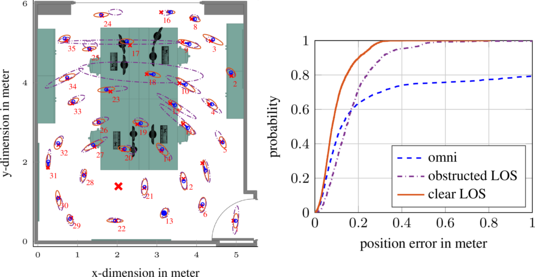 We further study the performance of SALMA in the presence of obstructed line-of-sight (OLOS) conditions, moving objects and furniture, as well as in highly dynamic environments with several people moving around, showing that the system can sustain decimeter-level accuracy with a worst-case average error below 34 cm. Figure: On the left, the evaluation results for an office environment (Dependable Things - SP1 office) are shown. The error ellipses (3-fold standard deviation) are shown for LOS conditions (red solid) and OLOS conditions (purple dashdotted). On the right, the respective cumulative distribution function (CDF) plot is shown, also including the results where an omni-directional antenna was used at the anchor. This work was conducted within the "Dependable Things" LEAD project in a collaboration between three TU Graz institutes (IHF, ITI, SPSC).